From the very first day that I landed in Hollywood, it was like being in an alternate universe. One where I was surrounded by celebrities, and not only were they friendly…but every so often they knew who I was and expressed love for my blog. I can’t tell you how honored and humbled I was by the whole experience!! 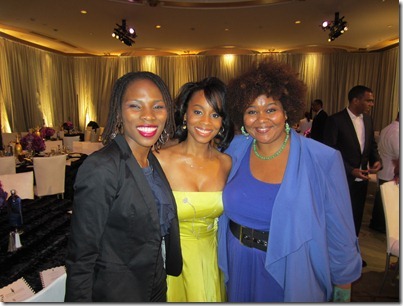 On Thursday February 24, Stephanie, Luvvie and I attended the Essence Fifth Annual Black Women in Hollywood Luncheon. at the Beverly Hills Hotel. Being in that room with SO many actresses and musicians, writers and directors I admire was a complete and total trip. In just a few hours, I rubbed elbows and took photos with so many of the stars I grew up looking up to. Luvvie already did her celeb encounter recap. 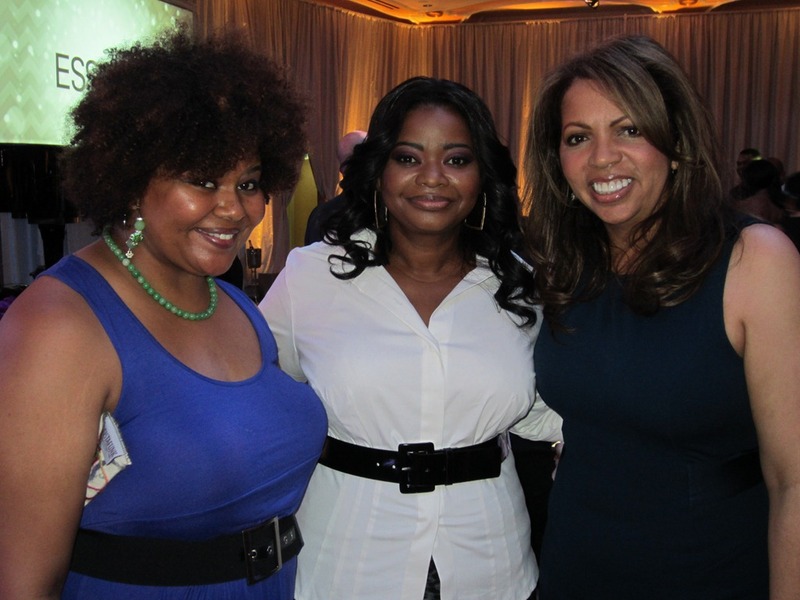 So now let me tell you about my favorite encounters during the Essence Women in Film luncheon! When Luvvie and I arrived, we really had no idea who to expect. So it was a completely pleasant surprise to see so many of our blogger friends in the house! I absolutely adore this photo! From left to right: Christen of Divas and Dorks, Marie Denee The Curvy Fashionista, Latoicha of Luxetips, Claire of The Fashion Bomb, Angel of Concrete Loop, me, and Luvvie! I LOVE me some Angel Laws!!! 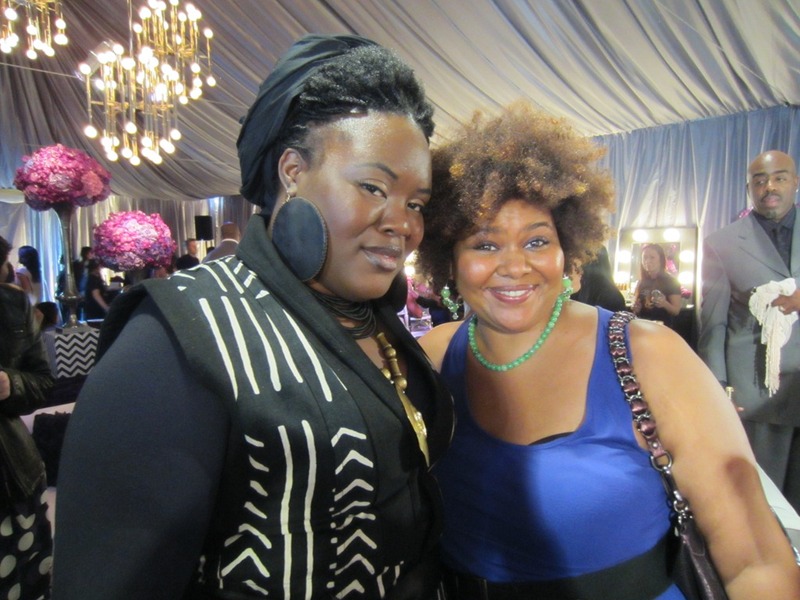 Angel was THE FIRST to really put Afrobella.com out there to the world and I will never ever forget her awesomeness for that. Throughout all these years in the game she’s remained real and genuine and 100% herself, and I really love and look up to her as a mentor in this online world. Thank you for always being you, Angel! if you don’t own her book, Angel’s Laws of Blogging, you are seriously missing out. It was such a pleasure to see fellow bloggers in the mix, in this room full of stars. It was nice to know Luvvie and I weren’t the only ones who were in a bit of disbelief about being there! I can’t even count how many celebrities we had the opportunity to meet in that afternoon alone. I can tell you about the famous people I was lucky enough to meet, have a moment of conversation, and enjoy the experience with. These are women who were sweet, kind, friendly, approachable, and took the time to make a stranger feel welcome. I really appreciated these encounters. 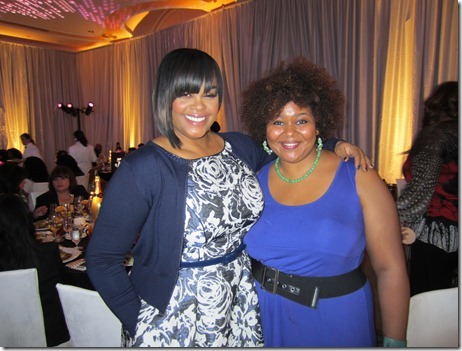 So in no particular order, here are the COOLEST celebrities I met at the Essence luncheon. 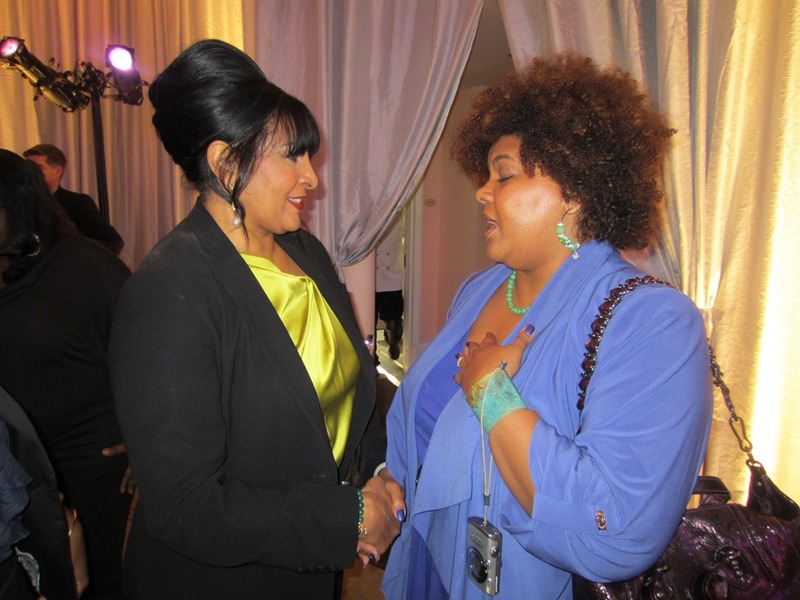 Pam Grier is an icon and a living legend and a treasure who was honored for her work at the Essence luncheon…but we shared a moment of in person bonding over Twitter. I love following Pam Grier on Twitter because she uses her fame so wisely and so well. Pam is intimately involved with a variety of truly inspiring charitable causes. She’s created the Pam Grier Community Garden and Education Center in Fort Worth, Texas, and works closely with animal rescue charities. In this photo I’m gushing over how amazing it was to meet her, and telling her how much I appreciate her tweets about charitable animal causes. She’s the kind of woman who holds your hand while you’re talking to her. She was SO lovely and gracious and approachable! 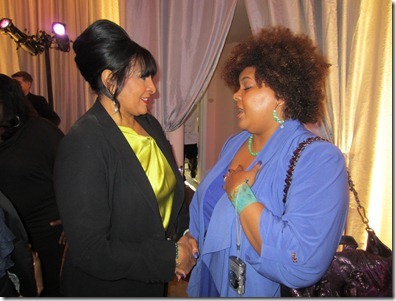 Thank you for being YOU, Pam Grier! You paved the way for ALL of us! Meeting Nichelle Nichols was honestly the happiest of accidents. 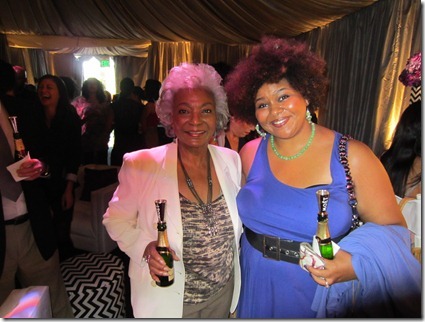 I wasn’t even aware of who she was when I was speaking with her – it wasn’t later that afternoon when the video retrospective of the celebrities was airing, that it dawned on me that I had befriended Lieutenant Uhura! Here’s how it happened — I had wandered off to check out the artists doing makeup in the L’Oreal tent, when this gloriously beautiful older woman with a cloud of white hair appeared before me. “I love your hair!” I told her. “I love YOUR hair!” she said to me, and we got closer to check out each other’s hair when we took this photo. Later that afternoon she came over to sit next to me at the luncheon and greeted me with the warmest grin “oh, THERE you are!” – but of course Nichelle Nichols had a seat of honor near the center of the room! So alas, she was re-seated and we didn’t get a chance to sit together long. But believe me when I tell you, she’s gentle and just a lovely woman in general. Did you see the movie Pariah? I did, and I absolutely loved it. Filmmaker Dee Rees tells a story that needs to be shared and appreciated by all audiences. Kim Wayans turns in a performance that is at turns relatable and harrowing. And Adepero Oduye is absolutely luminous as Alike, the teenage protagonist who struggles to walk the line between who she is, and who her parents and friends want her to be. On screen, Adepero Oduye plays a teenager and with her glowing skin, she’s completely believable. In person, she is 35 years old and DROP DEAD GORGEOUS. And SO friendly!!! When Luvvie and I approached her and introduced ourselves, she totally blew me away. Adepero not only knows Afrobella, but she loves my blog! “Afrobella is the s***!” she said, not once, not twice, but three times throughout the evening! Adepero, you made my DAY. Thank you for being so funny and sweet and approachable and awesome! Words can’t express. Meeting Jill Scott was everything I dreamed it would be – she was charming, nice, and down to earth. She remembered our interview, and was indescribably cool about being pulled away from her delicious salad for a photo opportunity. I wanted to gush about a million things – how much she inspires me in terms of her beauty and elegance and womanliness, how her songs like A Long Walk have become part of the soundtrack to my life, how almost every day someone in the street tells me “hey, do you know who you kinda look like…..?” and it’s always, always her (or Marsha Ambrosius) – but I managed to suppress my inner fangirl for the moment. Long enough to take the photo! Thursday nights at Casa Afrobella, you’ll find my husband and I watching our favorite comedies. I’m especially partial to Parks and Rec, 30 Rock, and Community – I love the quirkiness of their ensemble cast! Yvette Nicole Brown plays the sweet, loyal and devout Shirley on the NBC sitcom and I’ve been a fan of hers for a while now. 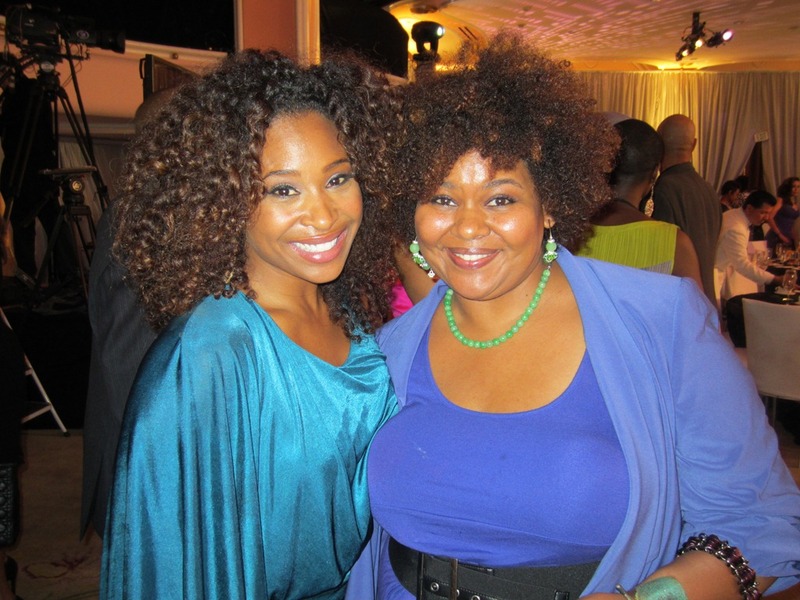 Yvette is one of few women of color rocking highly textured, curly hair on an ongoing basis on a mainstream television show, and that’s just one of the reasons I love her! Yvette is also one of the most friendly, sweet celebrities you could possibly hope to meet. She’s a hugger, as am I. When we met, Yvette had already seen a photo of me rocking my Oscar dress – my friends at Sofistafunk are providing her with gorgeous skirts for her latest appearances! At one point later in the afternoon I felt a bit overwhelmed and out of place, and I said as much to Yvette. She said to me, “you belong here.” That was so absolutely wonderful of her, and it meant a lot to me. Follow Yvette on Twitter or check out her Facebook fan page – she’s just as cool and friendly there! When a famous person is petite and stunningly gorgeous and dressed to kill…you don’t necessarily expect them to also be super friendly and wonderful to encounter. Anika Noni Rose was all of that and a little bit more. She’s also very regular and normal and just COOL. 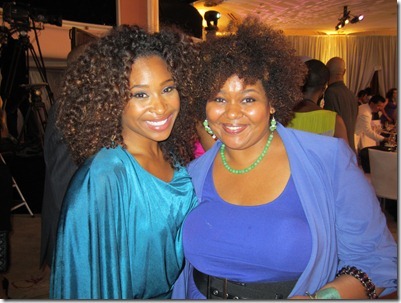 I got to meet her at the Essence luncheon, and then the next night at Mikki Taylor’s Commander in Chic dinner in Beverly Hills. Anika is talented and gorgeous as they come, but she remains regular and so, so nice. 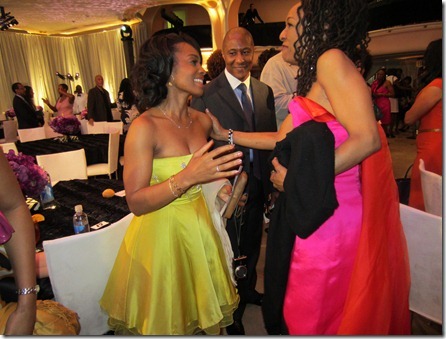 We got to witness Anika and singer/songwriter Siedah Garrett have a MOMENT and it was so beautiful! They’re both fans of each other’s work, and I believe this was their first occasion to meet in person. Funny backstory about myself and Tanika Ray. I’d wanted to interview her FOREVER, mostly about her gorgeous hair and the glorious tints and tones of blonde she was known for…I first interviewed her back towards the end of 2008. I was at my job at the time, and we had a really cool discussion about Obama and how awesome it would be if he actually won the presidency. I was super geeked to post it, and she was such a delightful interview! …and then I lost the digital recorder I used to do the interview and I felt like SUCH a jerk about it. Ugh. I didn’t find it until I quit my job and had to clean out my desk. LONG after Obama was already president! My Tanika Ray 2008 interview never saw the light of day, and I lived with those regrets. I never even had the chutzpah to be like “hey Tanika, hey. This is what went wrong in 2008. But now, in 2012? Obama’s up for re-election, and Tanika Ray is now my homegirl! Look at that! What I didn’t know back in 2008, is that Tanika is as cool as they come! I can say that she’s a new friend and I have had the pleasure of enjoying her company and she’s smart and funny and fierce and AWESOME. Right before leaving LA, Luvvie, Felicia Leatherwood, Tanika and Nikki, one of her best friends had dinner together and it was THE perfect way to end the trip. Good food, great cocktails, girlfriends gabbing even as the restaurant shuts down around us.Thank you for a wonderful sendoff from LA, Tanika!! 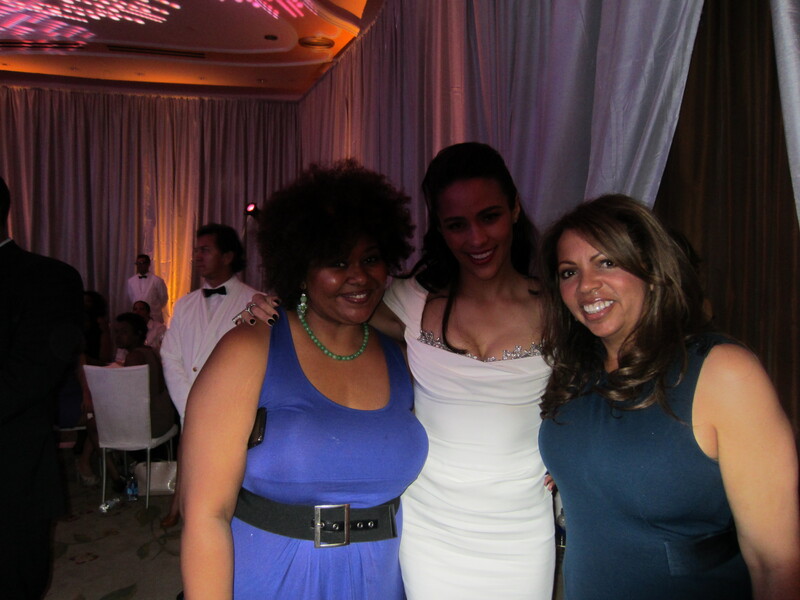 That’s me, Octavia, and the incredible Stephanie of FGW Productions who made all of these dreams possible! The women honored at the Essence luncheon ranged from veterans like Pam Grier, to actresses like Paula Patton, whose star has risen so much in the last few years. She gave a very heartfelt speech and we briefly met as she left the stage. Sorry for the shadow! Paula was very sweet, even though she was clearly having a very heartfelt and grateful moment! There were so many other amazing women at the Essence luncheon, I know I’m forgetting to share all of the exciting encounters I had. 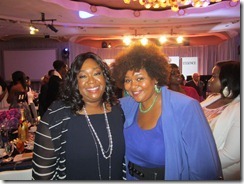 Top left: Shonda Rhimes is a legend in her prime and to just touch the hem of her garment for a moment was an HONOR. As a writer it was just such a pleasure and privilege to meet her. She has shown us ALL how far we can take our dreams if we just apply ourselves. 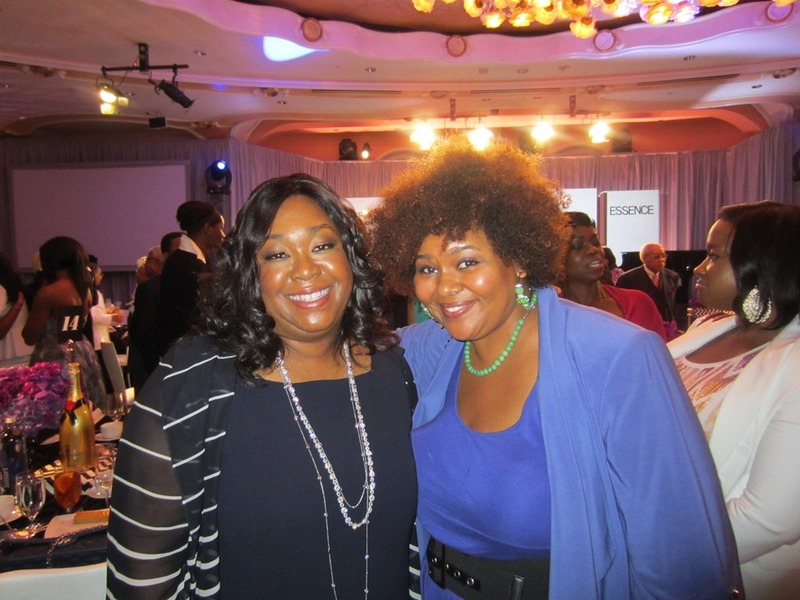 Fun fact – Shonda attended Marian Catholic High School, where my husband went as well! I asked her about what that was like and she admitted she was one of four black kids at the school. Having briefly lived in the area, I could definitely see that, and imagine what the experience was like. Top right: Sheryl Lee Ralph is EXACTLY what you imagine she’d be like in person – raw, real, raspy voiced, super nice and just that super cool sistergirl you’d love to kick it with! 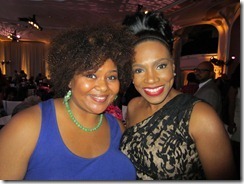 And because of her extensive work in AIDS awareness and charities, she is old buddies with Luvvie. 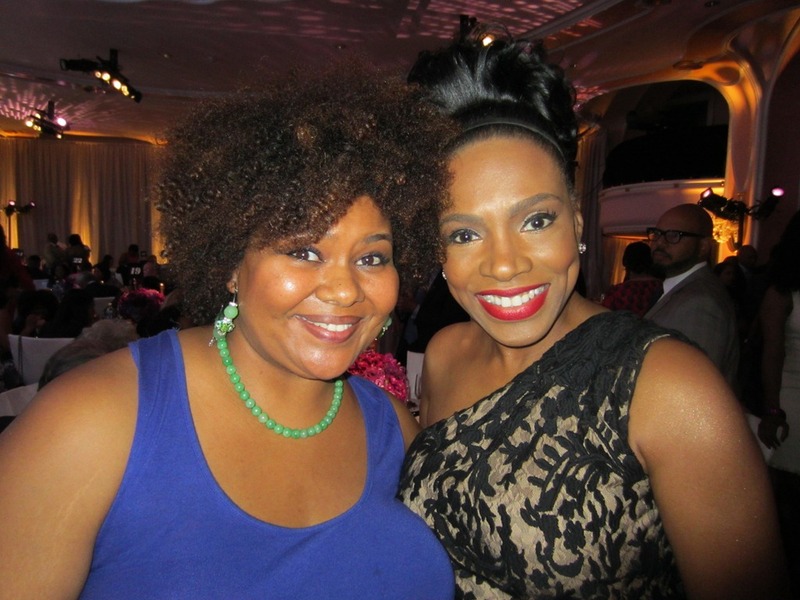 Sheryl Lee Ralph is down with the Red Pump Project and I loved meeting her! Bottom left: Kerry Washington is svelte, stunning, and sharp as a tack. 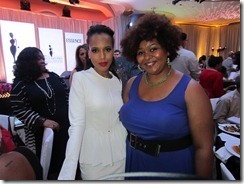 She is the star of Shonda Rimes’ new show Scandal (which will debut on ABC April 5 at 10/9 Central). Besides being one of my favorite actresses, Kerry is also an AMAZING interview who kills it on Bill Maher’s HBO show whenever she’s on. 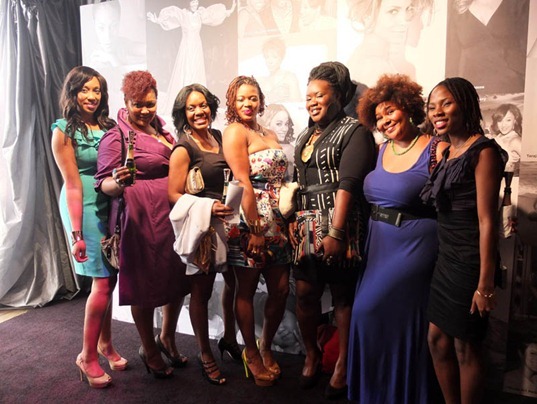 Bottom right: Viola Davis looked so beautiful with her natural hair at the Essence luncheon! 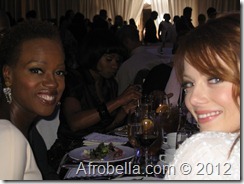 She sat with Emma Stone, who is like a gorgeous porcelain doll in person. I felt really shy to go up and introduce myself but they were kind enough to pose for me for just a second! Keep in mind that this was just one afternoon! I had a few more very wonderful celebrity encounters to share with y’all. Stay tuned – this week is about to be STAR STUDDED on Afrobella.com! « Oscar Hair, Makeup, and Fashion–Our Red Carpet Looks! 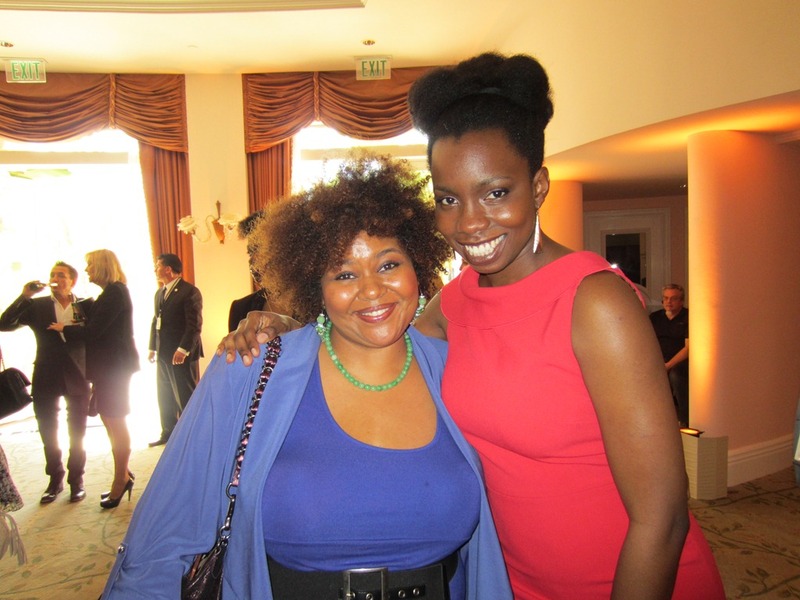 For your First Ever Essence Women in Film Luncheon you did great! Your post and pictures capture the proud and happy event that it was. 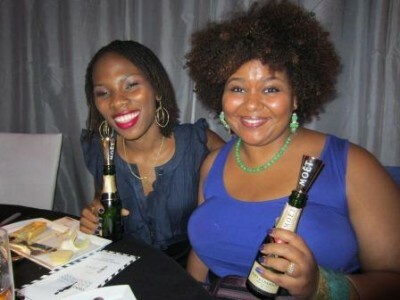 I so do hope that you and Luvvie get to do it in 2013 and beyond. Thank you for bringing these stars a bit closer to us. it was such an amazing experience!! I definitely hope to do it again in 2013! AWESOME!!! Thank you for sharing! of course! it’s my pleasure to share everything with you all! Thanks for bringing us this up close coverage. Does Essence do this every year? This seems like a wonderful celebration. 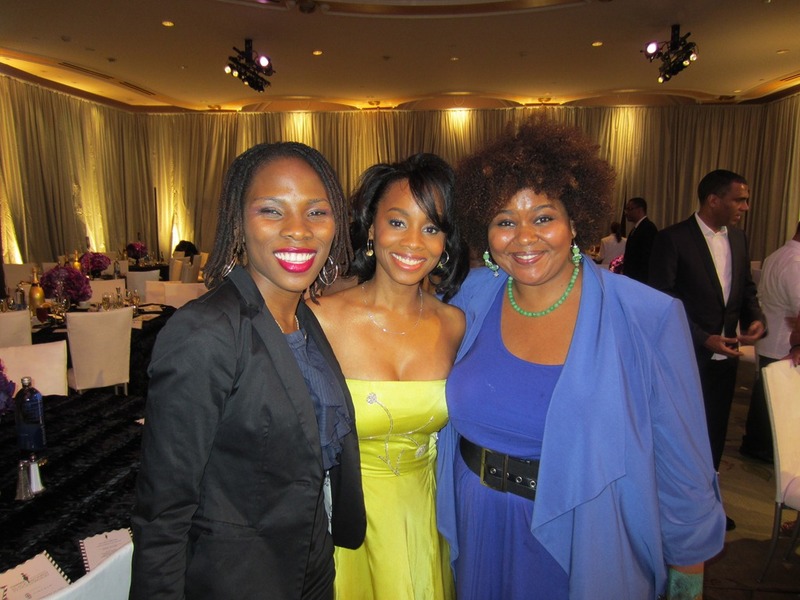 Your coverage made me feel especially close to all the talent and beauty of African American women in Hollywood. this is the fifth year of the luncheon. I really hope to return next year! What’s our next big event? LOL!! thank you Nikki!!!!! I have had some amazing experiences lately and I really appreciate the love and support! I’ll let you know what our next big event is, as soon as I know! thank you for the love, big brother!!! 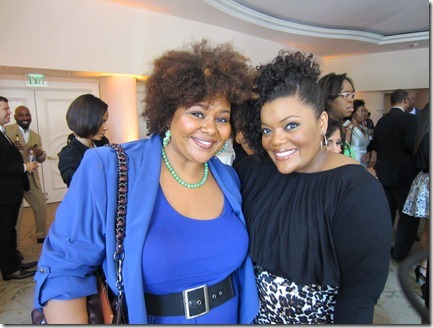 All the ladies look great ….and I almost did not recognize Jill Scott Beautiful!!!! Thanks for sharing and you belong there ,Bella ~beautiful! Wow. You did get around and meet so many talented actresses. I can’t believe Adepero Oduye is 35. She really does look way younger. And Pariah was an excellent movie. I’m so excited to see what Shonda and Kerry did with Scandal. Thanks for your tweets to let the rest of us have this experience with you. OMG – reading this, I feel like I was there (ok – I’m pretending like I was there) this is so great. Thanks for the recap! It must have been so exciting to meet all these wonderful women. I’m am so envious! It must have bee a thrill to meet all those successful and beautiful Goddesses. Rock on! Awesome, awesome, AWESOME!!! So happy for you and very appreciative that you shared this with us. Go Gurl! I’m dying here. This is just lovely. All these beautiful women in one place. Thank you so much for sharing. Thank you for sharing your amazing experience with us. All the amazing women you met is fine and good, but I need to know about the REAL star of these photos — that DRESS you are wearing. The color is AH-MAZE-ING on you! Share the dets!